To highlight the benefits of the natural world and inspire children, families and communities to enjoy the great outdoors, Her Royal Highness will co-design the 2019 Royal Horticultural Society Garden at the Chelsea Flower Show. The garden will build on Her Royal Highness’s passion for the outdoors and the proven benefits that nature has on physical and mental health. The Duchess is a strong advocate for the positive impact that nature and the environment can have on childhood development. In designing this garden, alongside, landscape architects Davies White, The Duchess continues to highlight how being active in nature can positively impact our physical and mental health. The garden is inspired by elements of The Duchess’s childhood and by more recent memories with HRH’s own children. 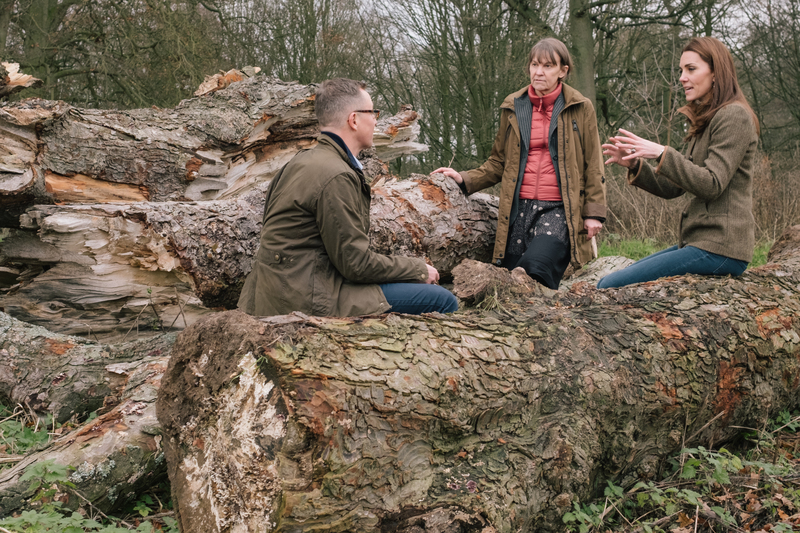 Wild planting and natural materials will be used to recreate a woodland wilderness where children and adults alike can feel closer to the great outdoors. It is hoped that the garden will recapture the sense of wonder and magic that adults enjoyed as children when exploring outside. 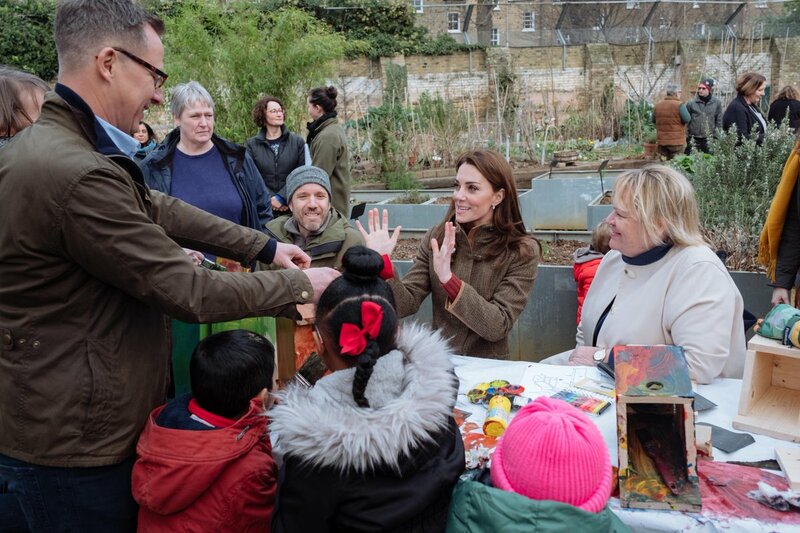 Following the announcement that The Duchess is designing a garden for the Chelsea Flower Show, HRH visited the King Henry's Walk Garden in Islington, London. The Duchess spoke to volunteers, plot-holders and local children about how the communal green space is having a positive impact on the community. For over a decade, the garden has provided food and solace for locals, with its growing plots, planting, pond and peaceful woodland area. During the engagement, The Duchess of Cambridge joined children from St Jude and St Paul’s CE Primary School to make pizzas in the garden’s outdoor pizza oven using herbs cultivated from the garden. Her Royal Highness also helped the schoolchildren make fat balls to give birds energy over winter. 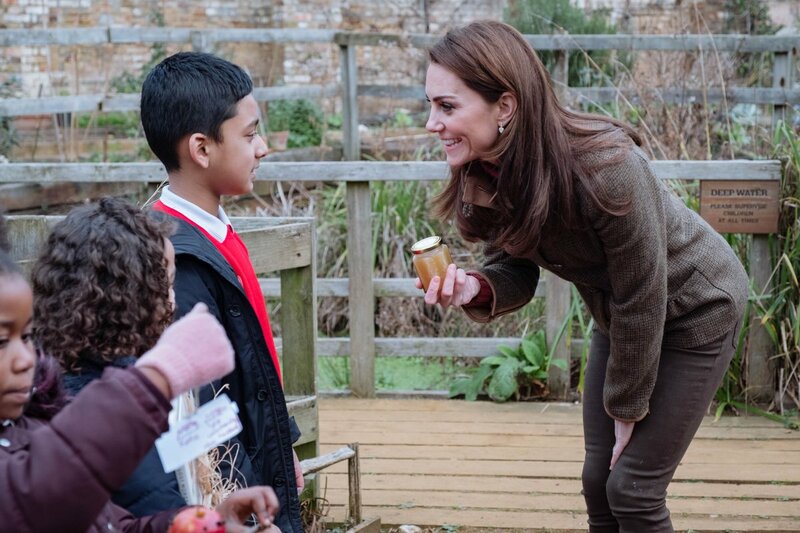 Before leaving, The Duchess was given honey, produced from bees in the garden. The Royal Horticultural Society, of which The Queen is Patron, organises the annual Chelsea Flower Show. The event has celebrated horticultural excellence since its inception in 1913 and has been visited by members of the Royal Family for many years, including The Queen’s grandparents, King George V and Queen Mary in 1930. The Queen has had a long relationship with the Chelsea Flower Show; here, Her Majesty admires the gardens in May 1971. The Queen enjoys another visit to the in 1994. In 2009, Her Majesty presented The Prince of Wales with the Royal Horticultural Society's most prestigious award, the Victoria Medal of Honour (VMH), at the Chelsea Flower Show. 10,000 stems were used to create this tribute to Her Majesty on her 90th Birthday in 2016. You can read about The Queen’s 2018 visit to the Chelsea Flower Show here. 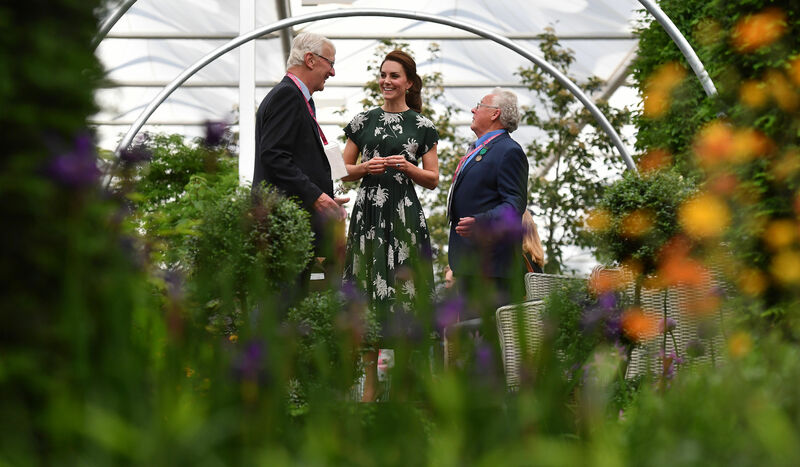 The Duchess of Cambridge, Andrée Davies and Adam White (of Davies White Landscape Architects), and the RHS revealed plans for their ‘Back to Nature Garden’ in February 2019. The woodland wilderness garden aims to get people back to nature, and highlight the benefits of the natural world on our mental and physical wellbeing. 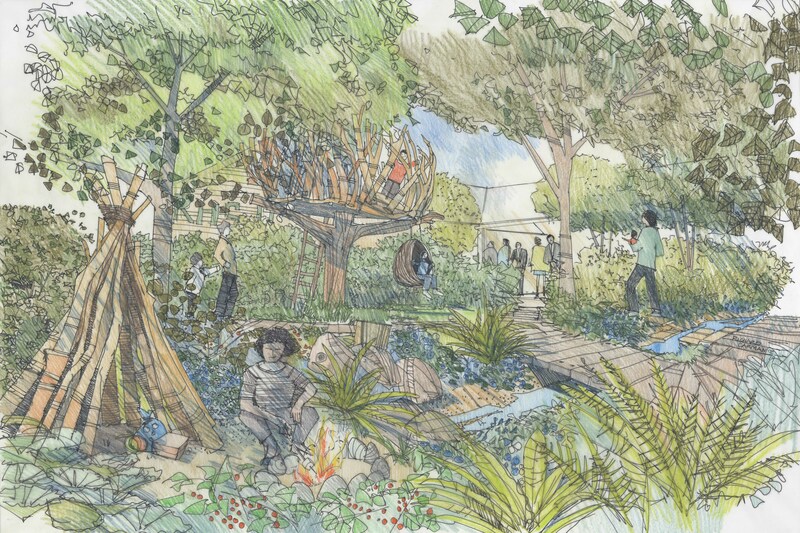 To inspire families to get outside and explore nature together, the garden will have a natural woodland feel and contain lots of unique design features. The garden’s centrepiece will be a high platform tree house, clad in stag horn oak that is inspired by a bird or animal nest. It will provide a wonderful place to retreat and look out through the trees. The garden will also feature a swing seat, rustic den and a campfire to encourage creative play and discovery for all generations. The design includes many natural elements that aim to stimulate active play, promoting the benefits of laying the foundations of physical health from a young age. Tree stumps, stepping stones and a hollow log will test and improve children’s balance, strength and co-ordination. It is proven that nature is good for wellbeing, so the garden is aiming to inspire interaction with the natural environment through its multisensory, green and blue plant scheme. The garden will be filled with incredible edibles, plants for craft activities, forest scents and a diverse range of plants, shrubs and trees of different heights and textures. A waterfall and stream will provide another sensory opportunity for children to paddle in and play imaginatively. The garden hopes to trigger memories of time spent in nature, and encourage others to go out and create new experiences in the great outdoors.